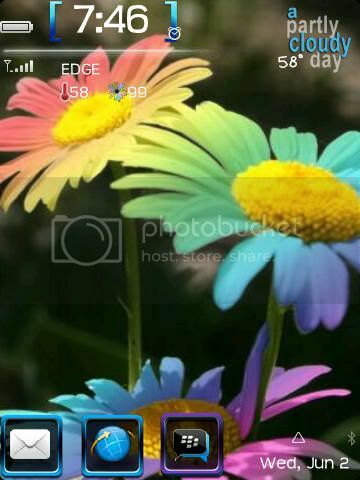 PS: huge thank you to Xan from iheartmybb for testing out this theme on her torchie! jules966, wendybeee, Maseroche and 2 others like this. so will there be an update then? its not updated yet, on mobihand it says current version is 1.0 and thats what I purchased! is anyone else's showing same icons?? uninstalled theme then reinstalled, and its working perfectly now! Last edited by judy77; 06-29-11 at 09:04 AM. Loving this theme! Very smooth and looks really good. the clincher for me was that the clock was clickable and that there's a hot key for the profiles. I use those two alot and not every theme caters for that. Here's a screen shot of how it looks. The icons showing are the first three icons on my menu btw. Luveee this theme....nice work eze !!! Hey guys theres another update with the time issue fixed...with the first update i forgot to change it the #'s sorry.. Awesome wallies!!!!! hi just got this theme and love it! !but how do you get rid of the blue marks() on either side of the time want to see like your first ss . You can put the focus on the bottom icons then hide them like we do on KB devices - or you can't? doesn't work, brackets there all the time. I show the dock highlight an icon the brackets still around the time ! really bothers me! thank you very much for version1.2 that fixes the focus issue on mainscreen. 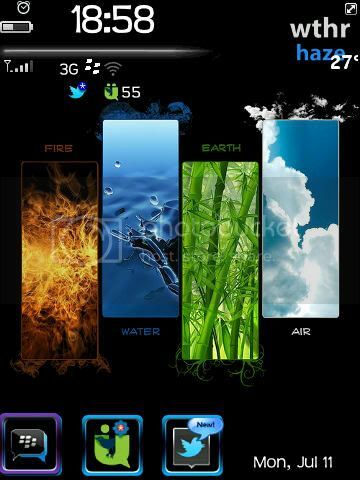 Love this theme!!! can you please tell me how to get berryweather icon to display just like the in the screenshot? Thanks in advance!! in the berryweather settings, go to the homescreen wallpaper, and then enable by checking the berryweather wp, then at the bottom choose the wp you want to use, and be sure to save before closing it out! also be sure u set the size u want and if u want on left or right side! i know this sounds confusing but its pretty easy once u do it! and u can only do this with the paid version! Last edited by judy77; 07-01-11 at 01:07 PM.